Etiology: Unknown, although trauma, stress, hypersecretion or accumulation of Harderian gland secretions, and superficial bacterial infections (i.e., Staphylococcus sp.) have all been associated with the development of lesions. Incidence: Nasal dermatitis is a fairly common disease problem in gerbils. Incidence of disease is higher in weanlings than in adults. Pathogenesis: Stresses such as overcrowding, weaning, and environmental variations can cause an increased secretion of porphyrin-containing fluid from the Harderian gland. Accumulation of these secretions around the external nares and eyes may result in irritation, self-induced trauma, and secondary bacterial infections. Clinical Signs: Alopecia, erythema, focal dermatitis, and frequent scab and ulcer formation are all typical features of the disease. 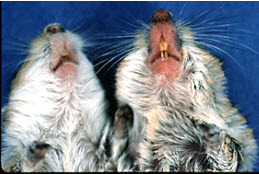 The perinasal area is normally affected most severely, at least in early cases (see photo, gerbil on right). The periocular region frequently becomes involved in more chronic cases. A well-established, moist, ulcerative dermatitis can spread to involve the remainder of the head, the forelimbs, and the ventrum of the chest and abdomen. Diagnosis: A history of recent stress and possibly mechanical injury, together with clinical signs, are usually diagnostic.